Web Game 'Cream Wolf' Is Surprising, Werewolf-y : All Tech Considered The Adult Swim Web game "Cream Wolf" is equal parts Atari-era graphics and 2010 humor and shocks. When the video-gaming press gets ecstatic about a free-to-play, Web-based game that's a throwback to the days of the Atari 2600, you know it has to be something special. 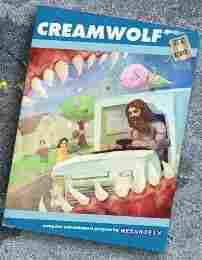 And in the case of "Cream Wolf," a new game on Adult Swim's game channel, it is. The retro graphics and humorous plot — a werewolf serves ice cream by day and then things get hairy at night — hide a nasty twist. The game's got a creepy vibe that's hard to shake. It's also very fun to play. But disturbing. And hilarious. I can say this without equivocation: it's the best ice cream van simulator / 8-bit-style werewolf game you will play this year.